The Cards team leader in homers remains Jhonny Peralta with nine, who hit his last one a week ago today. Yadier Molina is second with five, Allen Craig has four, Matt Adams three, Matt Holliday two, and Peter Bourjos, Matt Carpenter and Jon Jay each have one. Lack of power was the case for the Cardinals last year as well — though obviously it didn’t keep them from winning — as they finished 13th in the NL with 125 home runs. Carlos Beltran led the team with 24, while Holliday had 22 and Craig 13. The 2012 team was definitely a slugging one — the team had five players with 20 or more homers — and they finished seventh in the NL with 159 homers. (The Brewers were first with 209.) Beltran led the team that season too, with 32, while Holliday had 27, Craig and Yadi each had 22 and David Freese had 20. Yet even with all those homers, none was a walk-off winner. 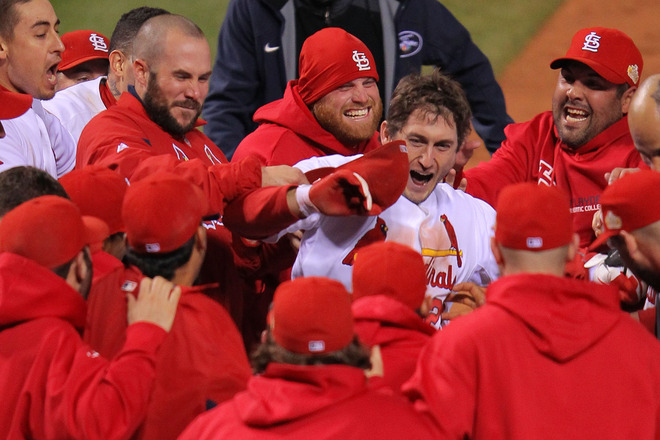 So how much longer will the Cards walk-off homer drought continue? Hard to know, obviously, and it would be interesting to know just how many walk-off homers other teams hit and how often. A quick search on Google did turn up this list ranking the 10 biggest homers of 2014, which actually includes more than 10 because of honorable mentions as well, and quite a few were walk-offs. Here’s hoping to experience that kind of thrill again, in perhaps a less crucial situation, sometime soon. This entry was posted in 2014 Cardinals and tagged 2011 World Series, David Freese, Game 6, Home runs, Jhonny Peralta, Walk-off winners by Christine Coleman. Bookmark the permalink.